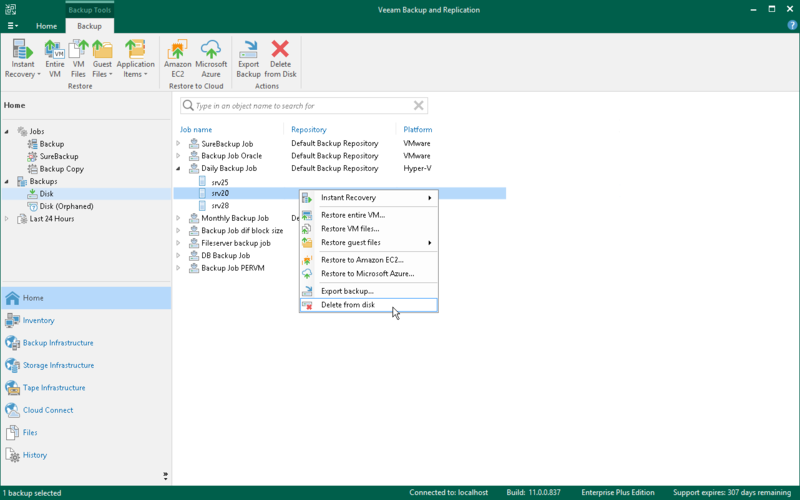 If you want to delete records about backups from the Veeam Backup & Replication console and configuration database and, additionally, delete backup files from the backup repository, you can use the Delete from disk operation. When you delete backup files from a disk, Veeam Backup & Replication deletes the whole chain from the backup repository. Thus, on the next run of the backup job, Veeam Backup & Replication will create full backups for VMs included in the job. Do not delete backup files from the backup repository manually. Use the Delete from disk option instead. If you delete backup files manually, subsequent backup or replication job sessions will fail. If the per-VM functionality is enabled, you can perform the Delete from disk operation for separate VMs in the backup. If you delete backup files for one VM, on the next run of the backup job Veeam Backup & Replication will create a full backup for VMs whose backup files are deleted. For all other VMs, Veeam Backup & Replication will create increments. In the inventory pane, select Backups or Replicas. In the working area, select the backup or separate VM in the backup and click Remove from > Disk on the ribbon. You can also right-click the backup and select Delete from disk.